Chris Davies is one of our PTs at Simply Gym Coventry Earl Place. He shows that it isn’t always about the physical transformation that gyms bring can with it improving your lifestyle. Chris said that before becoming a personal trainer at Simply Gym Coventry Earl Place, he was drinking heavily and often went out most weekends. He had been suffering with mental health issues for years and was diagnosed with depression in 2017. Though he was given medication, these often made him feel worse, giving terrible mood swings. He states that he felt fed up and would struggle to get out of bed some day. 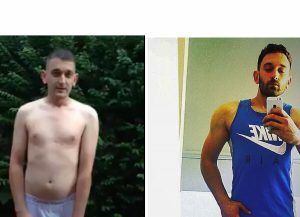 From this, he decided to use the gym, this helped him to overcome these issues. This is when he realised his moods changed and saw the impact that going to the gym can have. Then leading him to become a personal trainer. This story shows the powerful impacts the gym can bring to an individual and the impacts it can bring to change their lives.